In recent years, there is growing evidence that plant-foods polyphenols, due to their biological properties, may be unique nutraceuticals and supplementary treatments for various aspects of type 2 diabetes mellitus. In this article we have reviewed the potential efficacies of polyphenols, including phenolic acids, flavonoids, stilbenes, lignans and polymeric lignans, on metabolic disorders and complications induced by diabetes. Based on several in vitro, animal models and some human studies, dietary plant polyphenols and polyphenol-rich products modulate carbohydrate and lipid metabolism, attenuate hyperglycemia, dyslipidemia and insulin resistance, improve adipose tissue metabolism, and alleviate oxidative stress and stress-sensitive signaling pathways and inflammatory processes. Polyphenolic compounds can also prevent the development of long-term diabetes complications including cardiovascular disease, neuropathy, nephropathy and retinopathy. Further investigations as human clinical studies are needed to obtain the optimum dose and duration of supplementation with polyphenolic compounds in diabetic patients. Type 2 diabetes is a complex metabolic disorder associated with developing insulin resistance, impaired insulin signaling and β-cell dysfunction, abnormal glucose and lipid metabolism, sub-clinical inflammation and increased oxidative stress; these metabolic disorders lead to long-term pathogenic conditions including micro- and macro-vascular complications, neuropathy, retinopathy, nephropathy, and a consequent decrease in quality of life and an increase in the rate of mortality [1–3]. Among the multiple risk factors underling the incidence and progression of type 2 diabetes, diet is the main modifiable factor. An increasing number of epidemiological investigations show that diet rich in foods with high-content of phytochemicals, high total antioxidant capacity and polyphenolic compounds may be related to lower risk of diabetes and predisposing factors [4–9]. Based on the current understanding of pathophysiology of insulin resistance and type 2 diabetes, multiple pharmacological and non-pharmacological interventions have been developed with the aim of improving glycemic control and prevention of diabetes complications; in this area, recently the use of functional foods and their bioactive components have been considered as a new approach in the prevention and management of diabetes and its complications [10–13]. Due to their biological properties, polyphenols may be appropriate nutraceuticals and supplementary treatments for various aspects of diabetes mellitus. Our aim here is to review the current evidences in relation to several potential efficacies of these bioactive components on type 2 diabetes mellitus and related metabolic disorders. We obtained relevant articles, including in vitro, animal models and human studies with appropriate design, as well as review articles with good quality, published between 1990 to 2013, through searches of the Medline and PubMed databases. We first describe a brief introduction on dietary polyphenols, food sources and properties, and then summarize the evidence from in vitro, animal models and clinical studies. Polyphenols are natural phytochemical compounds in plant-based foods, such as fruits, vegetables, whole grains, cereal, legumes, tea, coffee, wine and cocoa; more than 8000 polyphenolic compounds, including phenolic acids, flavonoids, stilbenes, lignans and polymeric lignans have been identified in whole plant foods . These compounds are secondary metabolites of the plants that act as a defense against ultraviolet radiation, oxidants and pathogens . Polyphenols may be classified into several categories based on the number of phenol rings and structural elements that bind these rings to one another . Phenolic acids are approximately a third of the polyphenolic compounds in the diet and include two main classes hydroxybenzoic acid derivatives (protocatechuic acid, gallic acid, p-hydroxybenzoic acid) and hydroxycinnamic acid derivatives (caffeic acid, chlorogenic acid, coumaric acid, Ferulic acid, sinapic acid); berry fruits, kiwi, cherry, apple, pear, chicory and coffee are the foods with high content of these phenolic acids . Flavonoids are the most abundant polyphenols in the human diet and more than 4000 types of these compounds have been identified. There are six subclasses of flavonoids including anthocyanins, flavonols, flavanols, flavanones, flavones and isoflavones; anthocyanins (cyanidin, pelargonidin, delphinidin, malvidin) are found in the berries family, red wine, red cabbage, cherry, black grape and strawberry. Flavonols, including quercetin, kampferol and myricetin, have been mainly detected in onion, curly kale, leeks, broccoli and blueberries. Isoflavones are other most important dietary flavonoids that include daidzein, genistein and glycitein; soybeans and soy products are the richest sources of these estrogen-like structure compounds. Lignans, diphenoilc components with phytoesterogenic activity, have been found in high concentrations in linseed and other grains and cereals. Stilbenes occur in the human diet in low quantities; resveratrol, one of the well studied compounds of these groups, is largely detected in grapes and red wine [5, 16, 17]. It is estimated that dietary intake of polyphenols is approximately 1 g/day [18, 19]. Bioavailability of these bioactive components is dependent on food preparation processes, gastrointestinal digestion, absorption and metabolism . During the absorption pathway, dietary polyphenols must be hydrolyzed by the intestinal enzymes or colonic microflora, and then be conjugated in the intestinal cells and later in the liver by methylation, sulfation or glucuronidation . Polyphenols consequently reach and accumulate in the target tissue and induce biological properties; the polyphenol derivates mainly excrete through bile and urine. Several studies showed rapid absorption of the polyphenolic compounds, such as procyanidins, quercetin and flavanols into plasma, with plasma concentrations peaking at 2 or 3 hours after ingestion . Several biological activities and beneficial properties have been documented for dietary polyphenols, and some of the more well known ones include antioxidant, anti-allergic, anti-inflammatory, anti-viral and anti-microbial, anti-proliferative, anti-mutagenic, anti-carcinogenic, free radical scavenging, regulation of cell cycle arrest, apoptosis, and induction of antioxidant enzymes; more interestingly, dietary polyphenols could modulate some important cell signaling pathways such as nuclear factor kappa-B (NF-κB), activator protein-1 DNA binding (AP-1), extracellular signal-regulated protein kinase (ERK), phosphoinositide 3 (PI3) kinase/protein kinase B (Akt), mitogen-activated protein kinases (MAPK), and nuclear factor erythroid 2 related factor 2 (Nrf2) . Impaired carbohydrate metabolism and developing insulin resistance is the main metabolic disorder in non-insulin dependent diabetes mellitus leading to hyperglycemia. Altered digestion and absorption of dietary carbohydrate, depletion of glycogen storage, increased gluconeogenesis and over output hepatic glucose, β-cell dysfunction, insulin resistance of peripheral tissue and defect in insulin signaling pathways are more important causes of hyperglycemia . Although the use of oral anti-diabetic drugs including α-glucosidase inhibitors, biguanides, meglitinides, sulfonylureas, thiazolidindiones or insulin therapies are common clinical options in management of type 2 diabetes and hyperglycemia, but traditionally used natural agents have been considered for a long period of time. Among the known natural bioactive components and phytochemicals, recently polyphenols are very popular because of their anti-hyperglycemic effects, safety and non side-effects. Potential efficacy of polyphenols on carbohydrate metabolism and glucose homeostasis has been well investigated in in vitro, animal models and some clinical trials . In Figure 1 beneficial effects of polyphenols on management of blood glucose in diabetes are summarized. The hypoglycemic effects of polyphenols are mainly attributed to reduce intestinal absorption of dietary carbohydrate, modulation of the enzymes involved in glucose metabolism, improvement of β-cell function and insulin action, stimulation of insulin secretion, and the antioxidative and anti-inflammatory properties of these components [25–27]. Beneficial effects of polyphenols on management of blood glucose in diabetes. The hypoglycemic effects of polyphenols are mainly attributed to reduce intestinal absorption of dietary carbohydrate, modulation of the enzymes involved in glucose metabolism, improvement of β-cell function and insulin action, and stimulation of insulin secretion. One of the most well known properties of the polyphenols, especially flavonoids, phenolic acids and tannins, on carbohydrate metabolism is inhibition of α-glucosidase and α-amylase, the key enzymes responsible for digestion of dietary carbohydrates to glucose [26, 28]. Some polyphenols, including green tea catechins and epicatechins, chlorogenic acids, Ferulic acids, caffeic and tannic acids, quercetin and naringenin, could interact with absorption of glucose from intestine via inhibition of Na+-dependent glucose transporters, SGLT1 and SGLT2 [29, 30]. 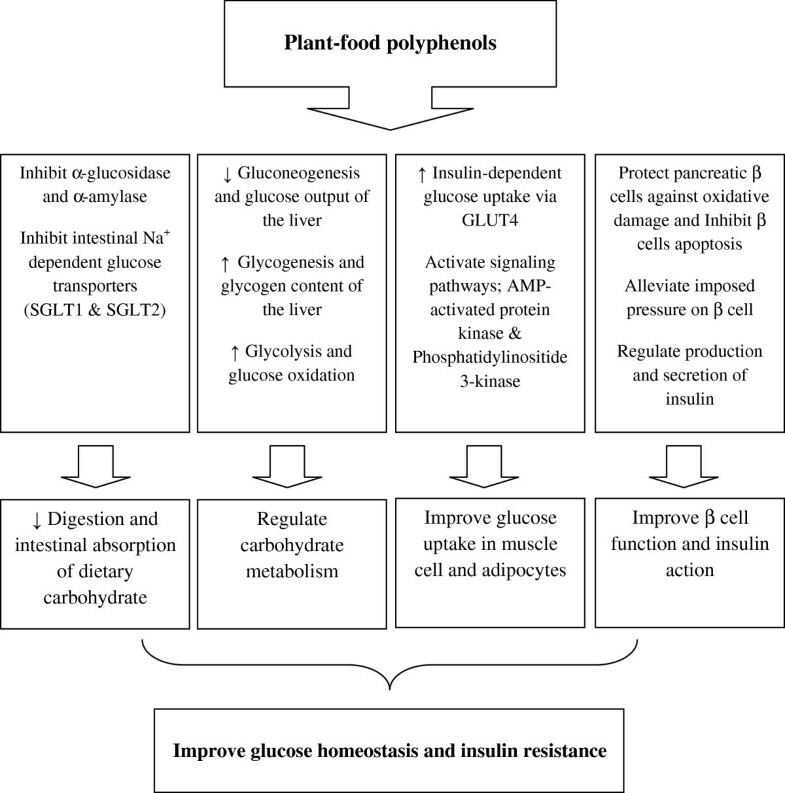 Some investigations have shown that polyphenolic compounds are also able to regulate postprandial glycemia and inhibit the development of glucose intolerance by a facilitated insulin response and attenuated secretion of glucose-dependent insulinotropic polypeptide (GIP) and glucagon-like polypeptide-1 (GLP-1) [31, 32]. Some polyphenols are able to regulate the key pathways of carbohydrate metabolism and hepatic glucose homeostasis including glycolysis, glycogenesis and gluconeogenesis, usually impaired in diabetes. Ferulic acid, a hydroxycinnamic acid derivate, effectively suppresses blood glucose by elevating glucokinase activity and production of glycogen in the liver and increased plasma insulin levels in diabetic rats . Supplementation of diabetic rats with hesperidin and naringin, two main citrus bioflavonoids, was accompanied with increased hepatic glucokinase activity and glycogen content, attenuated hepatic gluconeogenesis via decrease the activity of glucose-6-phosphatase and phosphoenolpyruvate carboxykinase (PEPCK), and subsequent improvement of glycemic control [34, 35]. Green tea polyphenols, mainly catechins and epicatechins have been shown to attenuate hyperglycemia and hepatic glucose output via downregulation the expression of liver glucokinase and upregulation of PEPCK ; in an in vitro study, epigallocatechin gallate (EGCG), one of the most abundant catechins in green tea, could activate AMP-activated protein kinase as a required pathway for the inhibition of gluconeogenic enzymes expression . Dietary polyphenols also influence peripheral glucose uptake in both insulin sensitive and non-insulin sensitive tissues; one study showed that phenolic acids stimulated glucose uptake by comparable performance to metformin and thiazolodinedione, main common oral hypoglycemic drugs . The results from the in vitro studies showed that some polyphenolic compounds such as quercetin, resveratrol and EGCG improved insulin-dependent glucose uptake in muscle cells and adipocytes by translocation of glucose transporter, GLUT4, to plasma membrane mainly through induction of the AMP-activated protein kinase (AMPK) pathway [39, 40]. AMPK, an important sensor of cellular energy status, has a key role in metabolic control; activation of this pathway is considered as a new treatment for obesity, type 2 diabetes, metabolic syndrome and a main target for anti-diabetic drugs including metformin [41, 42]. Interestingly, effect of polyphenols in activation of AMPK has been reported 50-200 times more than metformin . Some polyphenols also have potential to induce phosphatidylinositide 3-kinase (PI3k) as a key signaling pathway for up-regulation of glucose uptake . Isoflavones, particularly genistein, have amazing effects on pancreatic β-cells; Liu et al reported that anti-diabetic effects of genistein are not associated with stimulation of insulin synthesis, expression of glucose tranporter-2 or glycolytic pathway, genistein acts as a novel agonist of cyclic AMP/protein kinas A signaling, an important physiological amplifier of glucose-induced insulin secretion by the pancreatic β-cells [45, 46]. Furthermore, Fu et al indicated that genistein could induce protein expression of cyclin D1, a major cell-cycle regulator of β-cell growth and subsequently improve islet β-cell proliferation, survival and mass . Hyperglycemia-induced oxidative stress in pancreatic β-cells plays a pivotal role in the development of diabetes [48, 49]. Some of the polyphenolic compounds protect β-cells from hyperglycemia-induced and oxidative-induced damage; oral administration of phenolic-rich chestnut extract in STZ-induced diabetic rats had favorable effects on serum glucose and viability of β-cell through attenuation of oxidative stress, enhancing the natural antioxidant system, and inhibition of lipid peroxidation . Another very known phenolic compound, resveratrol (3,4′,5-trihydroxystilbene) found in grapes, wine, grape juice, peanuts, and berries, improve glucose tolerance, attenuate β-cell loss, and reduce oxidative stress in pancreatic islet . Resveratrol also alleviate chronic over stimulation induced-workload and impose pressure on the β-cells, and subsequently delay the degradation of pancreatic islets and progress of type 2 diabetes. This effect appears to be due to the diminished stimulatory effects of hyperglycemia in insulin secretion; some experimental and in vitro studies demonstrated that resveratrol has the potential to reduce insulin secretion through induction of metabolic changes in β-cells [51, 52]. Some protective effects of polyphenols on β-cells are related to the ability to modulate key cellular signaling pathways; anthocyanins-rich Chinese bayberry extract showed protective effects for pancreatic β cells against oxidative damage through up-regulation of heme oxygenase-1, modulation of ERK1/2 and PI3K/Akt signaling pathway and inhibition of β cells apoptosis . In summary, results of the studies acknowledge that plant polyphenols favorably affect several aspects of diabetes-induced metabolic disorders and modulate carbohydrate metabolism, glucose homeostasis, insulin secretion and insulin resistance. Progressive insulin resistance is mainly accompanied with pro-atherogenic cardiovascular risk profiles and consequently atherosclerotic coronary artery disease and other forms of cardiovascular disease are the major causes of mortality in type 2 diabetic patients . Dyslipidemia, undesirable changes in vascular endothelial and smooth muscle cells, lipid peroxidation especially oxidized low-density lipoprotein particles, oxidative damage and increased inflammatory mediators including chemokines and cytokines, hyper-coagulation and platelet activation have been considered as the main metabolic abnormalities in diabetes mellitus leading to cardiovascular disease . There is growing evidence suggesting that dietary intake of polyphenol-rich foods and supplementation with these bioactive components could have protective effects against diabetes-induced cardiovascular pathogenesis; the mechanisms involved in these properties mainly include regulation of lipid metabolism, attenuation of oxidative damage and scavenging of free radicals, improvement of the endothelial function and vascular tone, enhancement the production of vasodilating factors such as nitric oxide, and inhibition the synthesis of vasoconstrictors such as endothelin-1 in endothelial cells [55–57]. One of the most important favorable effects of polyphenols on cardiovascular system in diabetes probably is regulation of lipid and lipoprotein metabolism, and improvement of dyslipidemia. Based on research conducted in this area, polyphenolic compounds are capable of reducing digestion and absorption of dietary lipids. Oligomeric procyanidins, contained in apples had inhibitory effects on pancreatic lipase and triglyceride absorption . Apple procyanidins also induce hypolipidemic effects by decreasing of apolipoprotein B synthesis and secretion, inhibition of cholesterol estrification and intestinal lipoprotein production . The hypolipidemic effects of catechins and proanthcyanidins are related to inhibition of key enzymes in lipid biosynthesis pathways, reduce intestinal lipid absorption. Catechins also interact with proteins involved in cholesterol translocation from the enterocyte brush border (ATP-binding cassette proteins, multidrug resistance P-glycoprotein 1, B type1-scavenger receptors, Niemann Pick C-1 like 1 protein), change their function and effectively reduce cholesterol absorption . Administration of tart cherries as medicinal food rich in anthocyanins was accompanied with decrease in hyperlipidemia, hyperinsulinemia, fatty liver and hepatic steatosis through enhanced hepatic PPARα and some target genes including acyl-coenzyme A oxidase . Endothelial dysfunction, proliferation and migration of smooth muscle cells of the vessels are central events in the pathogenesis of diabetes-induced atherosclerosis. Some cardiovascular protective properties of polyphenols are attributed to modulatory effects on the vascular structure and function. Interestingly, some polyphenols inhibit the expression of major proangiogenic, prothrombotic and proatherosclerotic factors such as monocyte chemoattractant protein-1, vascular endothelial growth factor (VEGF) and matrix metalloproteinase-2 (MMP-2) in smooth muscle cells, by redox-sensitive and redox-insensitive mechanisms [62–64]. Oligomeric proanthcyanidins, found in red apple, cinnamon, cocoa, and grapes have the potential to protect vascular cell against diabetes-induced oxidative stress via increase in activity of superoxide, dismutase inhibition of NADPH oxidase and production of free radicals as well as decrease proliferation of smooth muscle cells . Flanan-3-ols modulate platelet hyperactivity and aggregation, regulate coronary blood flow, reduce endothelial inflammatory cytokines and free radicals, increase production and bioavailability of nitric oxide, and consequently atherosclerosis development . In human trials, consumption of high-polyphenol dark chocolate was accompanied with improvement of endothelial function in individuals with stage 1 hypertension, and attenuation acute transient hyperglycemia-induced endothelial dysfunction and oxidative stress in type 2 diabetic patients [67, 68]. Administration of other polyphenol-rich products such as grape seed extract, cranberry juice, grape and pomegranate juice also had a therapeutic role in decreasing cardiovascular risk factors in patients with type 2 diabetes and metabolic syndrome [69, 70]. Catechins, quercetin and anthocyanins have potent platelet-inhibitory properties and are considered as inhibitors of platelet cell signaling and thrombus formation . As reviewed by Pascul-Tresa, bioactive anthocyanins including delphinidin-3-rotinoside, cyanidin-3-glucoside, cyanidin-3-rutinoside, malvidin-3-glucoside and intestinal metabolites such as dihydroferulic acid and 3- (hydroxyphenyl) propionic acid prevent platelet hyper-activation and aggregation through inhibition of peptides activating thrombin receptor . Undoubtedly, one of the main protective properties of polyphenols in the development of cardiovascular dysfunction in diabetic condition is related to the ability of these bioactive components to prevent lipoproteins oxidation and production of advanced glycation end products. Dietary polyphenolic compounds also protect myocardial tissue against several undesirable changes and diabetic cardiomyopathy. Treatment of diabetic rat models with grape seed proanthcyanidins extracts effectively reduced the receptor of advanced glycation end products (RAGE), nuclear factor-kappaB (NF-kappaB), and transforming growth factor-β (TGF-β) gene expression in myocardial tissue . Human studies have confirmed the benefits of polyphenols on the cardiovascular system; Rizza et al in a randomized cross-over clinical trial shown that oral administration (50 mg/d for 3 week) of hesperidin, a citrus flavonoids, increased flow mediated dilation and reduced circulating inflammatory biomarkers (hs-CRP, serum amyloid A protein, soluble E selectin), decreased adhesion of monocytes, expression of vascular cell adhesion moleculs-1 and generally improved vascular function in patients with metabolic syndrome . Another cross-over trial conducted in postmenopausal type 2 diabetic patients, showed that supplementation with isoflavones from red clover (50 mg/day) after 4 weeks improved endothelial function and decrease systolic and diastolic blood pressure . In summary, results of the studies confirm that polyphenolic compounds attenuate several cardiovascular risk factors in diabetes; dietary polyphenols modulate lipid metabolism and dyslipidemia, improve vascular function, decrease oxidative and inflammatory-induced vascular damage, and regulate blood pressure. One of the pathogenic mechanisms that explain the development and progression of micro and macro vascular complications in diabetes is oxidative stress; increased generation of free radicals and an impaired antioxidant defense system in diabetic conditions induces imbalance of the oxidant/antioxidant status [2, 75]. Inhibition of these oxidative processes could prevent the onset and development of long-term diabetic complications . Most polyphenolic compounds and their active metabolites have been known as potent antioxidant phytochemicals due to their unique structure. As reviewed by Dembinska-Kiec, these compounds could scavenge free radicals, quench electronically excited compounds, reduce hydroperoxide formation, and attenuate production of reactive oxygen species (ROS) through modulation of several enzymes involved in the development of ROS including xanthine oxidase, cyclooxygenase, lipoxygenase, microsomal monooxygenase, NADH oxidase and mitochondrial succinoxidase . Some experts believe that polyphenols beyond the direct antioxidant capacities in scavenging of free radicals mainly act by direct interactions with important cellular receptors or key signaling pathways, which may result in modification of the redox status of the cell and may trigger a series of redox-dependent reactions . Plant polyphenols can enhance the endogenous antioxidative system, improve oxidant antioxidant balance, and effectively prevent oxidative damage; green tea catechins are the polyphenolic compounds most studied polyphenolic compounds in this area; these bioactive components decreased lipid peroxidation and increased plasma total antioxidant capacity; they also attenuated of stress-sensitive signaling pathways, prooxidant enzymes, and inducted of antioxidant enzymes including superoxide dismutase, catalase and glutathione peroxidase . In summary, polyphenols effectively attenuate oxidative stress, promote endogenous antioxidant defense system, and modulate oxidant/antioxidant balance. Adipocyte dysfunction is strongly associated with the development of insulin resistance, sub-clinical inflammation, β cell impairment and type 2 diabetes . Polyphenolic compounds have wonderful modulatory effects on many aspects of metabolic, endocrine and cellular signaling transduction of adipose tissue. Some polyphenols such as catechins increase β oxidation in adipocytes, down-regulate the enzymes and genes involved in lipogenesis including lipoprotein lipase, fatty acid synthase complex, peroxisome proliferator-activated receptor γ (PPARγ), CCAAT enhancer-binding protein-α, regulatory element-binding protein 1-c, fatty acid binding protein. Some polyphenols, up-regulate lipolysis pathways via induction of hormone sensitive lipase, adipose tissue lipase, increased gene expression of mitochondrial uncoupling protein 2 (UCP-2) and carnitin palmitoyl transferase-1 (CPT-1) in adipocytes [81, 82]. Anthocyanins, one group of phenolic compounds considered as modulators of adipose tissue metabolism, are bioactive components which improve adipocytes dysfunction and adipocytokines secretion in insulin resistance, increase β oxidation and decrease fat accumulation on adipocytes . Cyanidin and cyanidin-3-glucoside have shown several therapeutic effects on adipocyte dysfunction through decrease in plasminogen activator inhibitor-1 and interleukin-6, induction of mitochondrial uncoupling proteins, acetyl CoA oxidase, perlipin and adiponectin gene expression . One of the most important properties of polyphenols recently identified is its preventive effect against long-term diabetes complications including retinopathy, nephropathy and neuropathy; based on research conducted in this area administration of anthocyanins, flavonoids and other polyphenolic compounds in diabetic conditions may facilitate new approaches for improving the quality of life in diabetic patients. As reviewed by Ghosh et al, anthocyanins and anthocyanins-rich extracts have the potential to alleviate the developing pathways of some pathologic conditions related to diabetes; anthocyanins facilitate blood flow and prevent diabetes-induced microangiopathy, increase microvascular permeability, decrease leucocytes aggregation in vascular cell wall and improve capillary filtration of albumin . Purple corn extract containing cyanidin 3-glucoside and cyanidin-3-(6″-malonylglucoside) attenuated hyperglycemia-induced mesangial cell proliferation and matrix accumulation, and inhibited over-expression intracellular cell adhesion molecule-1 and monocyte chemoattractant protein-1, as major features of diabetic mesangial fibrosis and glomerulosclerosis . Recently there has been increasing interest in grape seed proanthcyanidin extracts as a natural treatment for some important diabetes complications; proanthcyanidin-rich grape seed extract inhibited the development of retinopathy, nephropathy and neurodegenerative damage in diabetic condition [87, 88]. Flavanols surprisingly have the potential to improve cognitive disorders and cholinergic dysfunction related to diabetes and other secondary consequence of changes in the nervous system induced by hyperglycemia and diabetes oxidative stress; administration of quercetin in diabetic rats improved mental function and memory via inhibition of acetylcholine esterase and attenuation of oxidative damage in nervous system . Green tea catechins including epicatechin, epicatechin-3-gallat, and epigalocatechin gallat decreased the synthesis of thromboxane A2 (TXA2) and increased prostacyclin I2 (PGI2), modulate the impaired balance between these ecosanoids as accelerators of thrombogenesis in the renal tubules, leading consequently improved glomerular filtration and kidney function . Type 2 diabetes, a clustering of metabolic disorder, is accompanied with other pathogenic conditions including sub-clinical inflammation and oxidative stress that subsequently leads to insulin resistance and long-term diabetes complications. The rising trend in the prevalence of diabetes complications suggests that current medical treatments for the management of diabetes are not sufficient and use of supplementary treatments, including functional foods and their nutraceuticals, could increase the effectiveness of diabetes management. Plant polyphenols including phenolic acids, flavonoids, stilbenes and lignans, based on in vitro studies, animal models and some clinical trials, have been proposed as effective supplements for diabetes management and prevention of its long-term complications. Further investigations using human clinical studies are needed to confirm the beneficial effects of polyphenolic compounds as supplementary treatments for diabetic patients. This study was funded by the Research Institute of Endocrine Sciences, Shahid Beheshti University of Medical Sciences, Tehran, Iran. The authors express to acknowledge the assistance given by Ms N.Shiva in language editing of the manuscript. The study was designed and implemented by ZB and PM. The manuscript was prepared by ZB, PM, and FA. All authors read and approved the final manuscript.